Are you or someone you know USM sweethearts? The Alumni Association is putting together a collection of real love stories featuring our alumni community members! We are looking for couples who attended Milwaukee Downer Seminary, Milwaukee Country Day, Milwaukee University School, or University School of Milwaukee. Whether you met in first grade at MUS or connected later in life, we want to hear your story! Stories should include where and when you first met, when you knew your significant other was 'the one', and where you are now. Stories must be typed and 250 words or less. Submit stories via email (alumni@usmk12.org) or by mail (USM Alumni Association, 2100 W. Fairy Chasm Road, Milwaukee, WI 53217). Include two photos of high-quality resolution. If possible, we would love to see a photo together from your time at school (USM, MDS, MCD, or MUS) and a recent photo together. 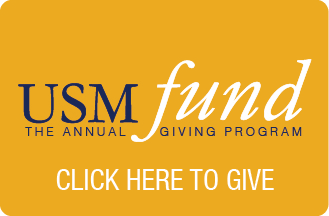 Get updated on everything happening at USM by reading USM Today, the magazine for the USM community! Explore the new USM Today website! Are you hosting an alumni event? Let us know at alumni@usmk12.org!